Review of the financial pathway underpinning the adult customer journey. The focus of the Financial Systems Review project was to gain a better understanding of the increasing number of issues and business inefficiencies created by the use of lengthy business processes and in some instances out-dated and, poorly integrated IT systems/functionality that do not wholly support the modern business. The overall aim was to review, with learning from best practice in other authorities, the overall financial processes linked to the commissioning, paying and charging for social care services with a view to introducing improved processes to underpin modern IT systems. We interviewed managers and staff at all levels to acquire the information necessary to document the process and its supporting systems. 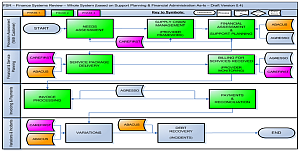 The following is a depiction of the business process with the Financial Systems Architecture. WCC has in place a roadmap for future development of the process and supporting systems. Reduce the number of manual IT related processes and replace them with automatic workflows.